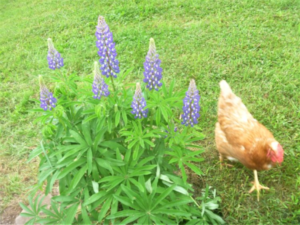 Last year we got a genuine answer to the age-old question “Why did the chicken cross the road?” But first, let me explain a little about chickens and gardens. If you’ve ever been brave enough to let a toddler help you weed the garden, you have a general idea of what it is like with chickens. They may indeed remove weeds, but most likely many of your precious plants as well. These plants may just be a casualty of enthusiastic digging or they may be too irresistibly tasty. Chickens love to eat bugs and worms (yes, they eat ticks! ), and will scratch in the dirt for hours looking for some. This is great for pest control but not so great for delicate plants and seedlings. It also means that you can’t keep mulch around your plants. Mulch is a great hiding place for bugs, so the chickens will remove it in search of their treats. My main vegetable garden is fenced off and they can’t usually get in there. One Autumn I let them in, figuring they would clean up the bugs, which they did. They also totally ripped apart the older hay bales in the process, and then devoured whatever kale had still been growing. In the gardens around my house, I have had to put protective cages around some of the plants, especially those that the chickens like to eat. The older group of chickens I have now are particularly fond of hosta. The group that I had before them never touched the hosta, so I am hoping that the new group I am raising will not be interested in them either. The cages around the hosta have kept the plants alive, but they are not attractive, and the leaves of the plants are ragged wherever beaks have managed to peck through. Knowing what a chicken can do to a garden, I was very concerned when my neighbor told me they were crossing the street to her yard. She has lovely gardens that are most likely not chicken-proof. I got lots of good exercise chasing my hens back home, sometimes several times a day. We had some fencing put up along the road in hopes of dissuading them, but they were still going over there. One morning, I decided to follow them after letting them loose. They didn’t even go near the section where the fence was at all. They went straight across the field to my other neighbor’s yard and straight to his bird feeder, where they cleaned up whatever had fallen to the ground. THEN they crossed the road to the other yard. Why? To check out THEIR bird feeder, which happens to be right near the road. From there, they casually wandered into the garden area.